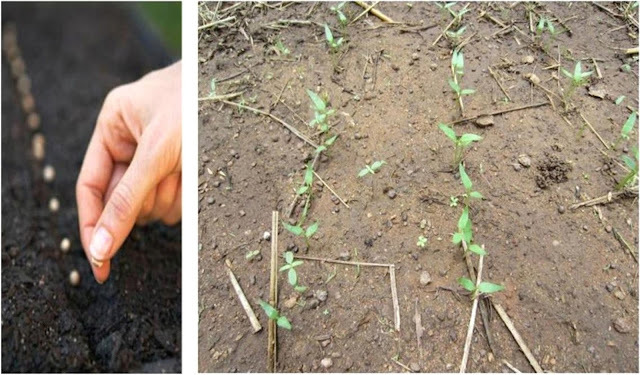 In this article, I would like to teach you about how to raise a tomato nursery (this is applicable to almost all other vegetables). You would learn all what you need to raise good seedlings and begin your journey into a one million dollar venture. tomato for consumption after you learn all the simple techniques involve in raising tomato yourself be it for your farm or your backyard garden. Happy reading! 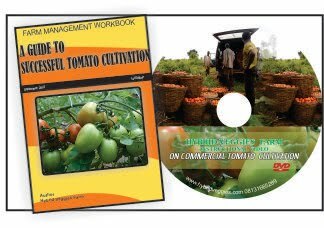 FORGET IT; YOU DO NOT NEED DEGREE IN AGRICULTURE NOR A MONTH LONG TRAINING TO BE SUCCESSFUL IN TOMATO PRODUCTION !!! Tomato seedling can be raised through different facilities as you have in the table below. Fully controlled environment. Structures are provided with adequate ventilation, irrigation, fertilizer application and even temperature are controlled. For big time farm investment. Do not try this as a beginner unless it is going to be managed by expert. Climatic conditions are normally favorable. Beds are raised after soil is loosen. This type of nursery is done only when natural conditions are favorable to plant growth and development. These are all media you can use to raise your seedlings but for a beginner, you may not necessary go too far. Please note that you can use direct seeds planting method by planting directly on the nursery soil or by the use of seed trays (or any other improvised seed containers). The use of greenhouse and poly-tunnels is therefore no go area for a beginner/learner. I would suggest the use of net house in this wet season but by that, do not start imagining a mammoth cost and the technicality involve in constructing one. With just N200 ($0.7) you are done. Locate where to get a well loosened sandy loamy soil if you do not have it on your farm or your backyard already. What sandy loamy soil simply means is a soil that does not hold water for long. Remove debris, stones and large particles from the nursery soil. Make it in form of a rectangle on the level ground if you prefer to make the nursery soil have direct contact with the ground. You could as well use permeable sacks (bagging sacks for garri, rice, bean etc) as the underlay before placing the soil on it as seen in the picture below. 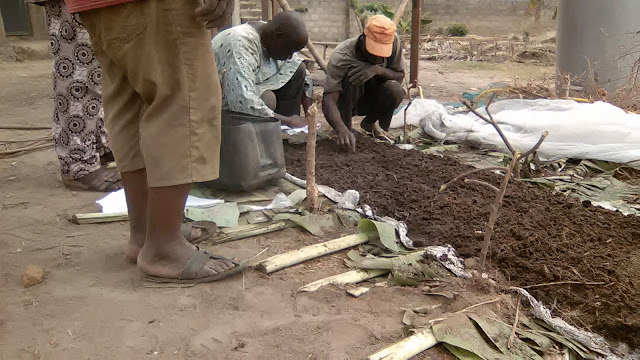 The advantage of this is that it would prevent insects - pest from the soil from gaining direct access to the nursery soil, it also serves to conserve water for the seedling particularly in the dry season and also aids transplanting process. 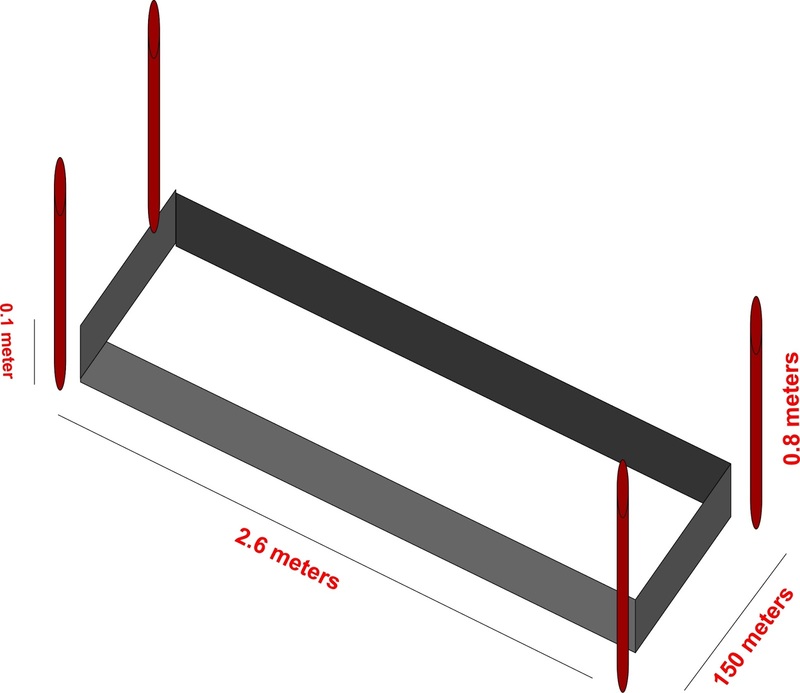 The nursery soil should take the dimension of 2.6m x 1.5m x 0.1m (0.1m as soil depth) if you prefer to use the bedroom mosquito net sold for N200 or any other dimension if you wish to construct your own net using window mosquito net. You would then need to mix the surface of the nursery soil with dried-old poultry manure or goat/sheep manure. Well done so far, you are almost done. Wet the soil with water to get it soaked but do not flood in order not to wash the soil away. You then make shallow rows of line, I mean very shallow as seen in the picture below. The distance between one furrow to another is around 10 cm. 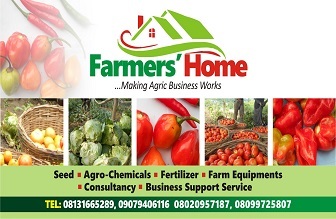 Now that you know and have purchased your tomato seeds (advisable hybrid except for some obvious reason), arrange them one after the other in the furrow as seen in the picture. Don’t allow seeds to gather on top of another in the furrow. This expectedly, would produce poor seedlings due to competition for soil nutrients and poor germination rate. Cover the furrow LIGHTLY with soil gathers from in-between the furrows and carry out another light wetting to compact the soil making it to have direct contact with the seeds. It is advisable you spray thereafter with a broad spectrum insecticide (EC with fumigant property) preferably those with contact mode of action. These would kill any insect in the soil or others which might gain entrance with potential of eating/damaging or carrying the seeds away. Cover with the nursery with the mosquito net as seen in the picture and tuck the edges into the soil to prevent any pest from gaining entrance. Tasking so far I guess! You are almost done. Cover the top of the net with palm tree leaves or any other leaves materials to prevent direct sunlight and rainfall from reaching the nursery soil but in doing that support the palm tree leaves so that they don’t press down the net toward the nursery soil. 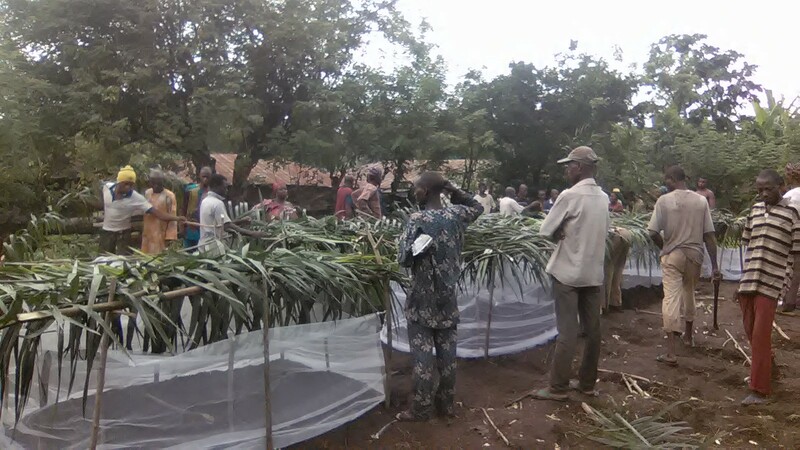 In case heavy rain fall period, you may cover the whole nursery with transparent polythene before rainfall or particularly at night to prevent flooding of the nursery. You would then need to do everyday light (sprinkling) wetting if you used polythene or observe when the soil is dry when rain hasn’t fall for a period of two day. Please, note the soil should always be moist but NOT SOAKED to prevent damping off disease from affecting the seedlings. Click to Read Part 2 of this Article. Visit again for part two of this topic but should you have any question, comment and contributions on this class, feel free to post such.